(5/10) In a nutshell: No, this has nothing to do with the TV-series. This is a 1936 mashup of gangster films and sci-fi horror films by Casablanca director Michael Curtiz, starring Boris Karloff in yet another Frankensteinean role. But despite the derivative scenes and the flimsy script, Curtiz and Karloff make this a surprisingly stylish and human effort. 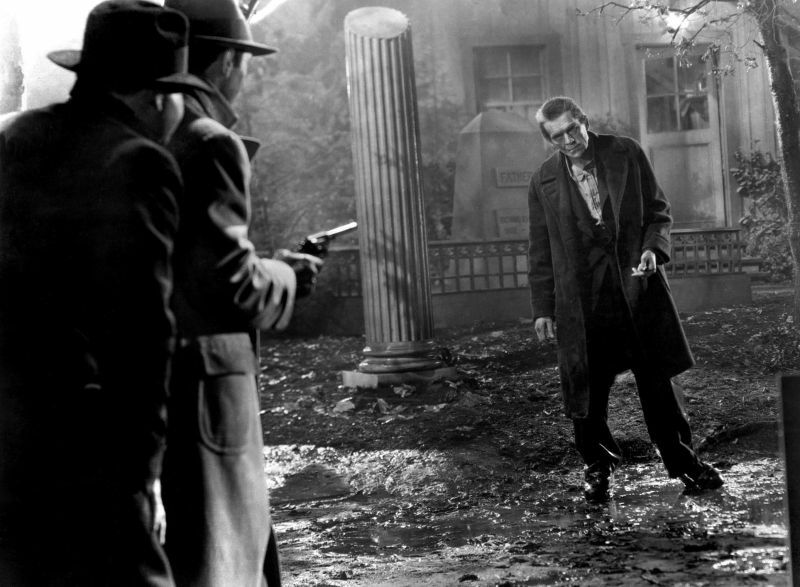 Boris Karloff as the resurrected pianist John Ellman confronts his killers. There is little doubt that Boris Karloff is by a long shot the actor that has risen from the dead the most times in cinema history. By 1936 this was already a trademark. Although a highly regarded actor for most of his later life, the years bewteen 1931 and 1936 can perhaps be called something of a golden age for the British expat. It was in this time he helped define the American horror genre with films like Frankenstein (1931, review), The Old Dark House, The Mummy, The Mask of Fu Manchu (1932), The Ghoul (1933), The Black Cat (1934), The Bride of Frankenstein (1935, review) and The Invisible Ray (1936, review). But by 1936 he was also – despite stops on gangster films like Scarface (1932) and period dramas like The House of Rothschild (1934) – deeply stuck as a typecast actor. And by 1936 everybody wanted a piece of the Karloff magic, including Warner, a that put out cheap gangster flicks at the same speed that Universal churned out horror films. Original poster. The girl in the dress has absolutely nothing to do with the film. So Warner were able to get a hold of the master and slated him for a film combining sci-fi horror and mobster courtroom drama. As director the studio called on another immigrant, Hungarian-born Michael Curtiz. Curtiz, originally named Mihály Kertész, was one of the members of that extremely influential Hungarian film generation that partly shaped both British and American films (with some help from the Austrians and the Germans). Curtiz was already a Warner staple, known for making visually beautiful and clean pictures with a lot of atmosphere, and for being just as comfortable in almost any genre, from romantic comedies to gangster films, period dramas and horror movies. But he was now on the way up, after directing Errol Flynn and Olivia de Havilland in the classic 1935 swashbuckler Captain Blood, which earned five Oscar nominations, including best picture and best director. 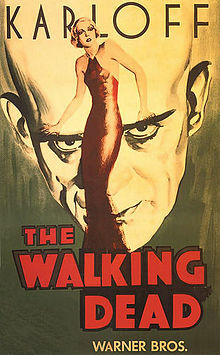 After The Walking Dead, Curtiz of course became best known for directing Oscar-winning films like Yankee Doodle Dandy (1942), Casablanca (1942) and Mildred Pierce (1942). This collaboration between Karloff and Curtiz didn’t result in anything that would go up in the Top-5 lists on either artist’s career list. Still it’s quite a refreshing little film with a lot of qualities that were lacking in some of the rather stuffy later Universal horror films, more interested in parading out monsters to the box office than actually making good films. Warren Hull, Marguerite Churchill and Borisl Karloff in a publicity still. The film begins as a snappy, fast-talking gangster film, following the prosecution of a swindler. 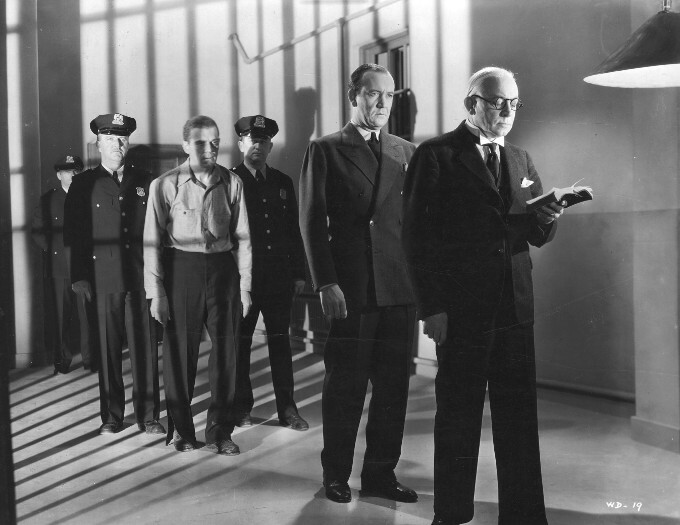 Despite threats from the mob, Judge Shaw decides to stand up for the law and condemns the guilty mobster to ten years in prison. As the crime syndicate seeks a way to get back at Shaw without incriminating themselves, they happen on the brilliant pianist John Ellman (Boris Karloff). Karloff is down on his luck, after having been released from prison where he has resided after accidentally killing his ex-wife’s lover in a fit of rage. Using Ellman’s desperation, the hit-man Trigger (Joe Sawyer) frames him for the murder of Judge Shaw (Joe King). But a young couple, Nancy and Jimmy (Marguerite Churchill and Warren Hull) see the gangsters dragging Shaw’s body to Ellman’s car. The mobsters then warn the young couple that for their own good, ”they haven’t seen a thing”. 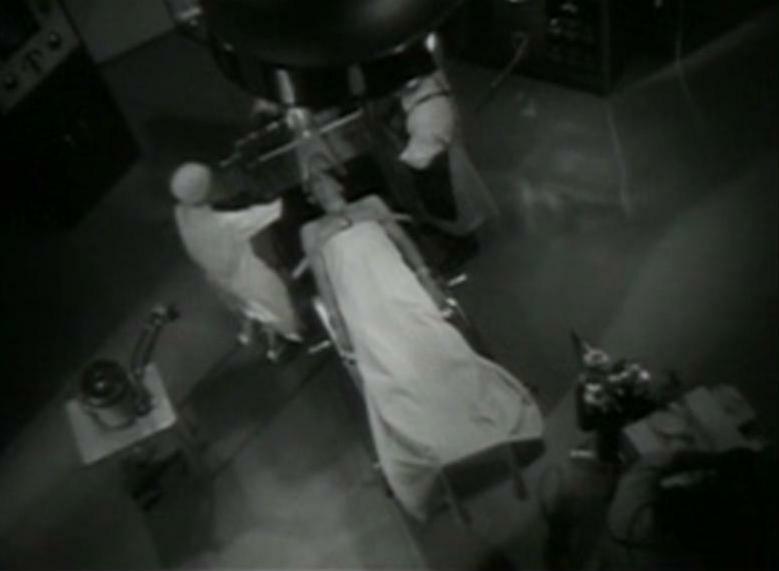 Nancy and Jimmy have been introduced earlier as a happy young couple who both work as assistants to the brilliant scientist Dr. Beaumont (Edmund Gwenn), who is perfecting a machine to keep human organs alive outside the body. As the trial starts, Jimmy wants to stand up for Ellman, but Nancy – out of fear of the mob – convinces him to keep silent. The trial gets under way and despite Ellman’s pleas for the young couple who saw the incident to step forward, all evidence directly points at his guilt. His lawyer Nolan (Ricardo Cortez) – actually one of the mobsters – does nothing to help the matters, as he states that Ellman’s only hope is for the couple to corroborate his story. Which he knows they will not. Thus Ellman is sentenced to the electric chair. But on the eve of the execution Nancy and Jimmy have a change of heart, and with the influence of the prominent Dr. Beaumont they get a hold of Nolan, who stalls enough for Ellman to be executed. But Beaumont doesn’t lose any time, but brings Ellman’s body to his lab filled with sprarking Strickfadens ripped straight from Frankenstein’s castle – and a Lindbergh heart – more of that later. Miraculously, the three are able to resurrect Ellman, but he is a changed man. When earlier he was a mellow, soft-spoken, yet optimistic and pleasant chap, the new Ellman is pale as death, speaks little, and shuffles around as if partly paralyzed on his left side, brooding with those dark, fierce Karloff eyes. He is the Walking Dead. John Ellman in the atmospheric death row scene. The script of the film is wafer-thin and filled with more plot holes than a cheddar cheese. The good-natured prosecutor seems to be on to the mobsters’ ruse from the very beginning of the trial, and helps Ellman get to them in the rest of the film – so why does he so relentlessly call for the electric chair during the trial? How does Ellman play the piano after his resurrection with his left side paralysed? And is it really conceivable, that after weeks of trial, the young couple would get a change of heart just hours away from Ellman’s execution? There is also a domestic-romantic subplot concerning Nancy and Jimmy that Curtiz keeps coming back to, but that goes absolutely nowhere. Does this setup remind you of anything? Another flaw of the film is that Warner so obviously wants to cash in on the Frankenstein craze after the release of The Bride of Frankenstein. Not only does Karloff remove his false teeth in his non-speaking scenes to get that gaunt Frankenstein’s monster look, but his post-resurrection makeup pays clear homage to Jack Pierce’s iconic monster makeup. Furthermore, in this otherwise sober-looking film, the fantastical Strickfaden machines in Beaumont’s lab look completely out of place. Karloff is even strapped to a stretcher just as in the original Frankenstein, and then spends half of the film lumbering around like the famous Creature. And it could have been worse: the original script had Ellman being mute after his resurrection, but Karloff sent the script back to the writers. It’s not Frankenstein we’re making here, guys. But ultimately the film’s merits win over the flaws. One big help is Michael Curtiz, who does a wonderful job keeping every scene beautiful and interesting. The directing is mostly workmanlike, but stylish. And here and there Curtiz adds some great effects, like the expressionistic shadows and a tilted camera as Ellman is walked to the electric chair – or the imaginatively lit and edited scene of Karloff eyeing his murderers during his piano concerto. Or the harrowing off-scene deaths of the mobsters, of which in particular the one of the train accident is superbly well made. 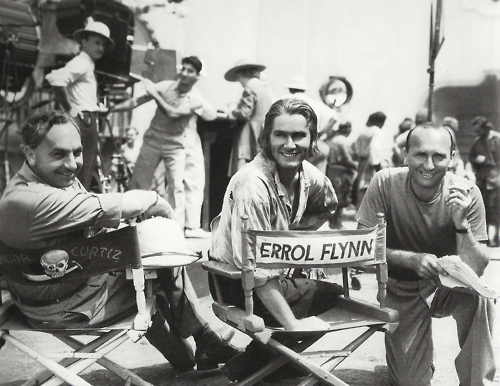 Erroll Flynn (center) and Michael Curtiz (right) on set of one of the eight films they did together. Curtiz also had help from double Oscar-winning cinematographer Hal Mohr, who took home his first statue in 1935 with A Midsummer Night’s Dream and his second in 1944 with The Phantom of the Opera. One of his last films was the hardly Oscar-worthy sci-fi movie The Creation of the Humanoids (1962). 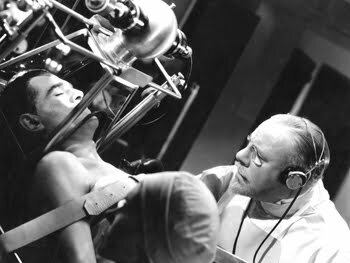 Editor Thomas Pratt also worked on the 1939 horror sci-fi The Return of Dr. X, with a slightly miscast Humphrey Bogart in the lead. Three-time Oscar-winning costume designer Orry-Kelly could probably have done this film in his sleep. Despite the fact that the thick-accented Curtiz was famed for being unintelligible when speaking English (he once famously was brought a poodle when he asked for a puddle) he somehow managed to get the best out of his actors (although he did use dialogue directors). 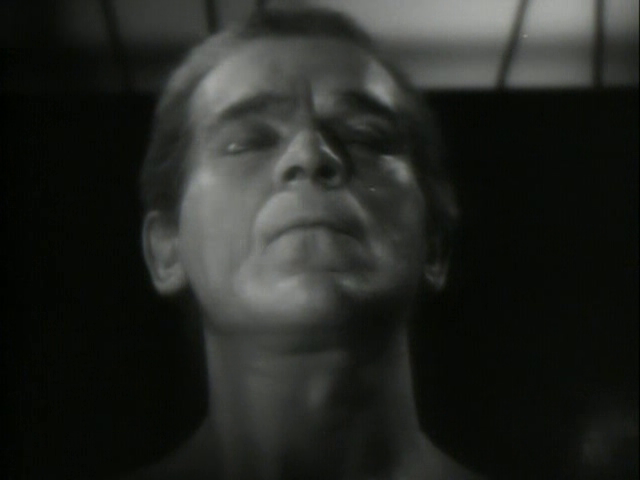 Karloff shines in the first part of the film as the hapless Ellman, and even though he goes through the motions as the walking dead, he sometimes manages to conjure up a beautiful spark of humanity in the confused post-mortem pianist. I wouldn’t go as far as saying it is one of Karloff’s best roles, but certainly better than the dozens of crazy scientists he was slated to play after this film – a film that sort of marks a turning point in his career. After this the quality of the films he was asked to do slowly declined and every other role was that of a mad scientist or a murderer brought back to life – unless it was one of the five films in which he portrayed the Chinese detective Wong. He did, however, flourish on stage in the forties and the fifties, and made a bit of a comeback to films in the sixties after starring in two of Roger Corman’s acclaimed Edgar Allan Poe films and voiced, as well as narrated, the classic Christmas tale of How the Grinch Stole Christmas in 1966. And Karloff is for once surrounded not just by effective character actors, but actually good actors who can deliver naturalistic performances. There is clearly a good rapport going on between Marguerite Churchill and Warren Hull, and it is a shame that the script loses their story. Warren Hull was a dashing leading man in a short string of B-movies for Warner, and later rose to minor fame as the hero in three of Repulic series: The Green Hornet Strikes Again (1939), Mandrake the Magician (1940) and The Spider (1941). He then became a successful radio personality and TV game show host, before retiring because of Parkinson’s. 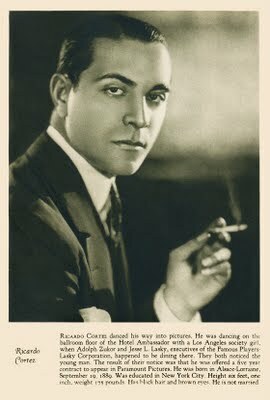 Jakob Krantz aka Ricardo Cortez. New Yorker Jakob Krantz, born of Austrian parents, was remodelled as the latin lover Ricardo Cortez by Warner, as he was slated as the successor for the tragically demised Rudolph Valentino in 1926. Despite some minor hits with romantic films, this career never took off, though, and he was soon slated for B-movie leads and supporting parts. He carries his role well, and with both grace and character, as the slimey mobster attorney, and is one of the joys of The Walking Dead. Primarily a stage actor, Briton Edmund Gwenn was however a much sought-after character actor in Hollywood for many decades, and played a number of rather big supporting roles in many A-films in the thirties and forties, before scoring gold with his memorable role as Kris Kringle in yet another Christmas classic, Miracle on 34th Street in 1947, a role which earned him an Oscar for best supporting actor. He did not dabble much in sci-fi, but is remembered by genre fans as the superiorly best actor in the 1954 film Them! (review) which more or less invented the giant insect subgenre. He also appeared in a few episodes of the TV-series Science Fiction Theatre in 1957. In The Walking Dead he doesn’t have much to work with, but does bring a good dose of his jovial humanity and grace to the role of the benign scientist. For decades, the burly Barton MacLane’s name synonymous with brutal, snarling henchmen and outlaws, and as such he appeared over 40 years in a number of both A- and B-films. His only other sci-fi film was the 1941 version of Dr Jekyll and Mr Hyde, where he had a substantial supporting role as Sam Higgins. Joe Sawyer, another Warner staple, reappeared in sci-fi in 1953 with Jack Arnold’s It Came From Outer Space (review). Marguerite Churchill, Edmund Gwenn and Karloff. 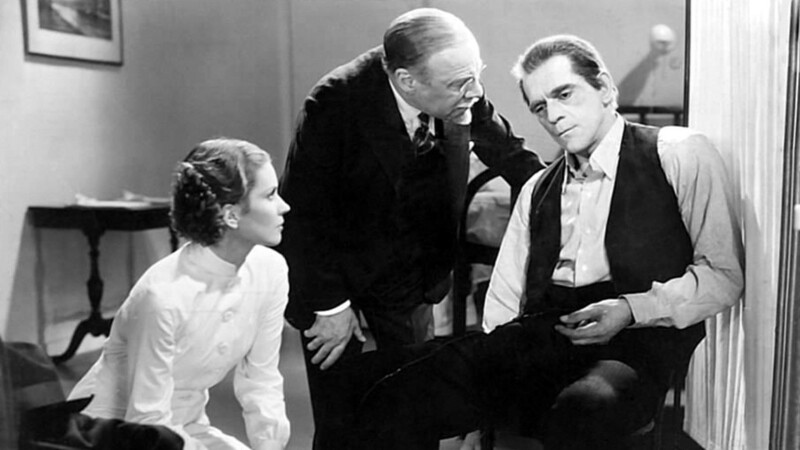 Speaking of derivative jack-of-all-genres screenwriter Robert Hardy Andrews, one of five writers on the film, came up with a very similarly themed story for another Karloff vehicle – Before I Hang – in 1940. Lillie Hayward worked on the werewolf film The Undying Monster (1942). None of the writers were genre staples, which may explain why the script is on one hand very derivative of Frankenstein and not many other horror films, and on the other hand why it’s got a slightly different tone than many other ripoffs. Oh yes, I promised a bit on the Lindbergh heart. In the scene where Ellman is being resurrected, Jimmy tells Nancy: ”Keep that Lindbergh heart pumping! Don’t let it stop!”, and we cut to a strange-looking glass apparatus that rhythmically pumps a fluid over what looks like an organ. To modern audiences, this may seem like just another sci-fi gizmo, but to audiences of 1936 it was more than just a throwaway moment. Everybody knew what a Lindbergh heart was. Today most people probably haven’t heard about the Lindbergh heart, but most know Charles Lindbergh, the charismatic aviator who crossed the Atlantic in 1927. Well, Lindbergh was not only a daring pilot, but a brilliant technical engineer, who had taken a keen interest in matters of the heart because of a relative with a heart problem, that could have been cured, if the heart could have been taken out of the body for a short period of time. But back in the twenties this was not possible, as there was no way of keeping the heart alive outside the body. 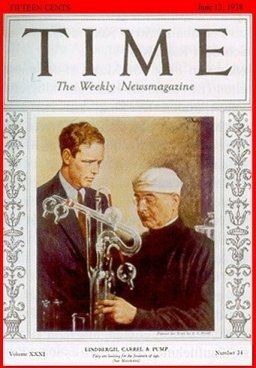 Lindbergh and Carrel and their heart pump on the cover of Time Magazine in 1938. So, all in all – despite the rather flimsy script, Michael Curtiz, Boris Karloff, and a strong supporting cast are able to turn what might have been just another bad Frankenstein ripoff into a visually pleasing and quite entertaining human story. One can almost see Karloff fighting off the Frankenstein parallels, and ultimately Warner’s desire to recreate the classic horror film becomes a bit too obvious. The Walking Dead. 1936, USA. Directed by Michael Curtiz. Written by Ewart Anderson, Peter Milne, Robert Hardy Andrews, Lillie Hayward, Joseph Fields. Starring: Boris Karloff, Ricardo Cortez, Edmund Gwenn, Marguerite Churchill, Warren Hull, Barton MacLane, Henry O’Neill, Joe King, Addison Richards, Paul Harvey, Robert Strange, Joe Sawyer, Eddie Acuff, Kenneth Harlan, Miki Morita, Ruth Robinson. Music: Berhard Kaun. Cinematography: Hal Mohr. Editing: Thomas Pratt. Art direction: Hugh Reticker. Costume design: Orry-Kelly. Makeup: Perc Westmore.